All engineers are familiar with dynamics processors. We use compression, limiting, expansion, and gating to shape and control our music. These wonderful machines (or bits of code as it were) help us to give music and sounds the impact, clarity, and movement that we need to help give the song its necessary emotional impact. But what happens when broadband processing isn’t enough? Sometimes we are given audio that requires a finer tool than any broadband processing can give us. 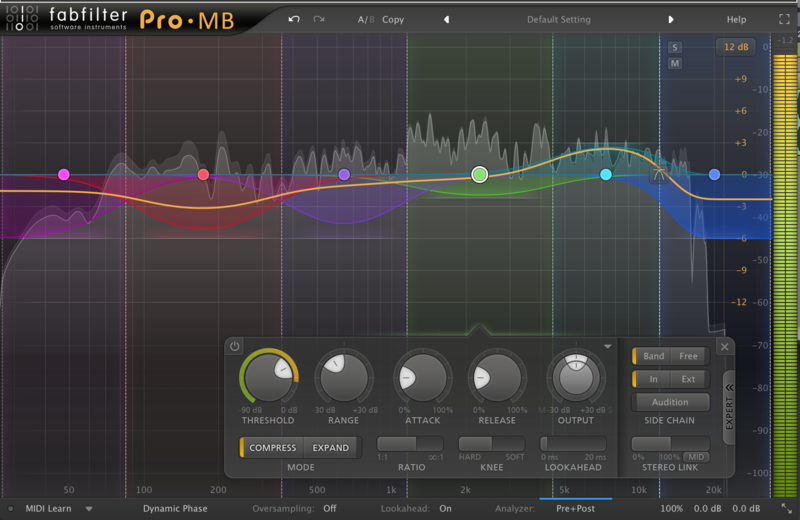 Enter FabFilter Pro•MB, multiband dynamics processor. Multiband processors allow users to break the audio range up into various bands and treat them separately. For example, a user may only want to compress a certain frequency range. 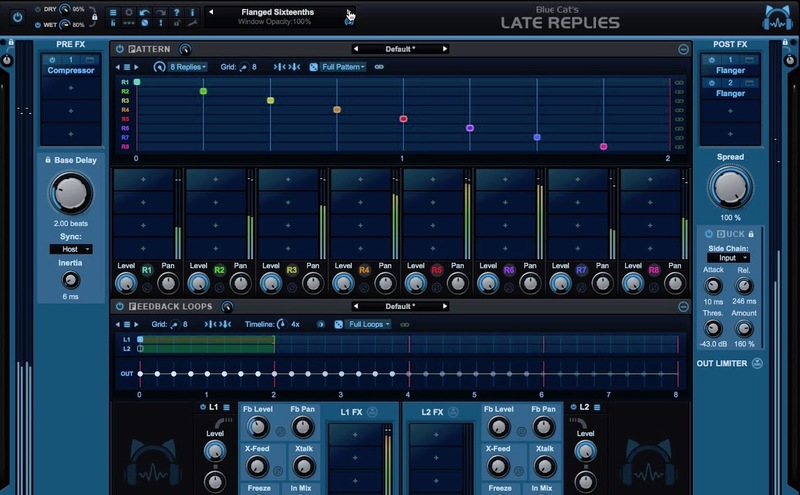 They are excellent tools for mastering, stems/loop mixing, and general problem-solving. Let’s dive in and take a closer look at FabFilters offering. The GUI shown here, like all of FabFilters plugins is simply stunning. The GUI is beautiful, well-laid out, scalable, and easy to read at any size. 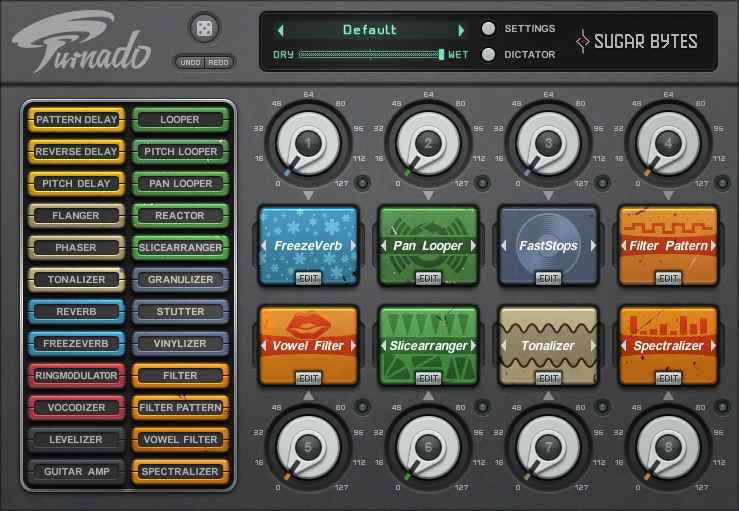 Across the top are the standard FabFilter controls for every plugin including Undo & Redo, A/B comparison controls (with the ability to copy from one to the other…clutch for trying experimenting without worrying about losing your settings), preset selection, and the Help button. Help not only directs you to the website or the manual but you can also turn on tool-tips that will pop-up whenever placing your cursor over a tool, making usage especially easy for newcomers. The large, clean graphic display, that occupies most of the plugin window, shows a frequency range of 30 Hz- 30kHz and offers a scalable dynamic range offering between +/- 3 dB to +/- 30 dB. (See Fig 2) Additionally, users can zoom in on the frequency range to make incredibly fine adjustments. 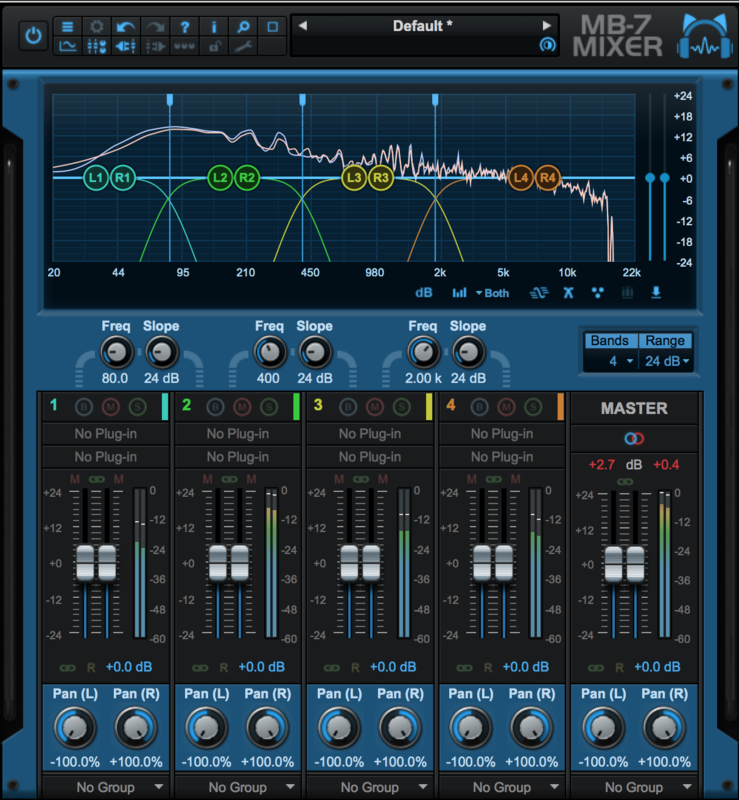 (See Fig 3) At the far right side of the interface is a stereo dBFS output meter with over 100 dB of dynamic range. The individual bands can be soloed or muted as needed, which is great for isolating trouble spots. Additionally, the crossover points for each band are fully adjustable so engineers can work as transparently, or aggressively, as they wish. More global controls exist at the bottom with MIDI learn being furthest left making it easy to assign and use any MIDI controller (a huge boon when trying to use your ears instead of your eyes). 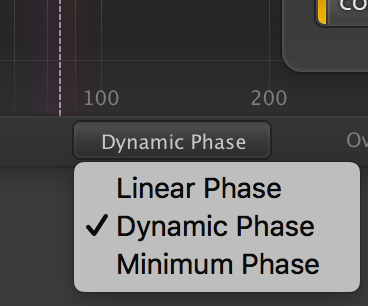 Next up is the phase response and FabFilter offers us Linear, Dynamic, or Minimum Phase shift depending on your needs. Minimum phase is the standard way most multiband processors split up audio with the lowest latency. Linear Phase adds can add a decent amount of latency but gives much more transparent results and can help minimize phase issues like when processing one mic in a multi-mic setup. 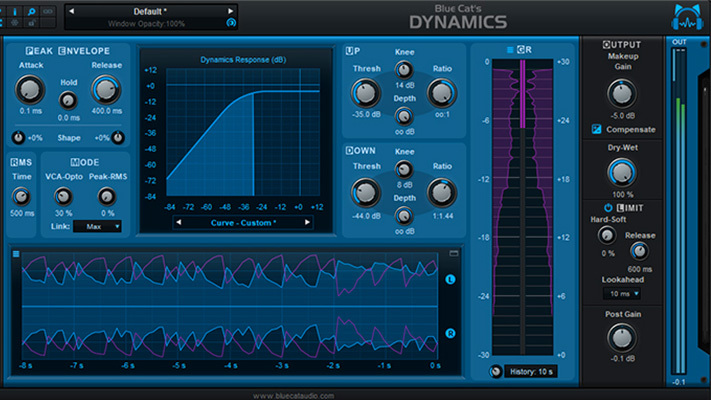 Dynamic Phase splits the difference and offers the best of both worlds. Oversampling and Lookahead options are next (Key features when trying to keep aggressive processing from adding artifacts and aliasing, at the cost of some latency). The Analyzer settings are very flexible allowing users to see the signal pre or post-processing and the ability to see the sidechain as well. Analyzer options included freezing the display (which actually only “freezes” the highest point as it evolves…very useful when combining with the zoom feature for delicate surgery), as well as resolution, speed, and tilt. This last feature lets you measure with no tilt, displaying only the absolute amplitude, or to angle the display to more closely match nonlinear human perception. Next, we have input and output meters, input and output panning (which should be labeled as Balance) and a very interesting “Mix” between 0-200%. (See Fig 4) This is a killer feature that allows users to scale up/down the amount of work being done. The ability to minimize or exaggerate the overall effect is staggeringly useful. 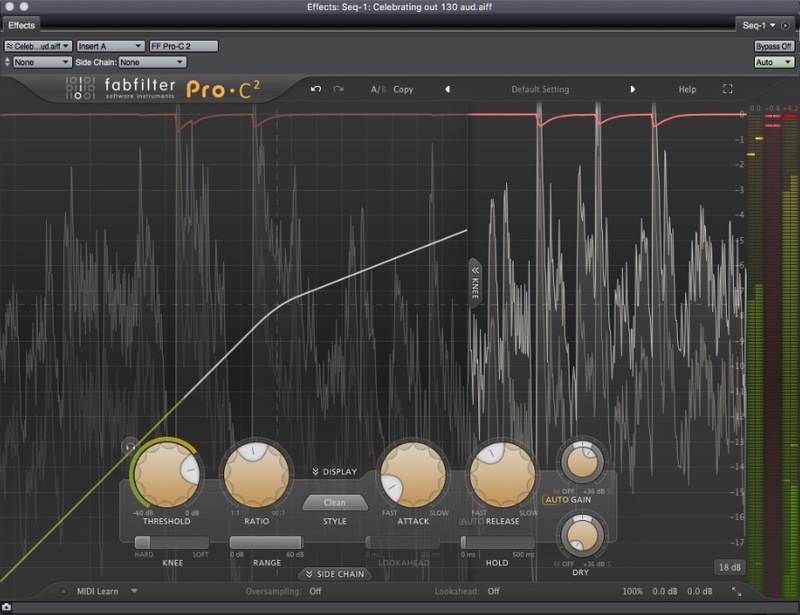 While many pieces of offer a mix, or blend control between 0-100%, few go the extra mile like FabFilter. It’s a nice feature to just get more of exactly what it’s doing. Especially without having to alter the gain structure of the surrounding plugins. I’ve used this feature extensively for fine tuning and quickly finding the sweet spot between too much and too little. With multiband work, this is essential. Lastly, we come to our Band Controls. (See Fig 5) Offering up to 6 bands, the Pro•MB has a floating window with all of the parameters for the individual. All the standard controls are here (Threshold, Attack, Release, Range, Output, Knee, and Ratio), including the option to use each band as either a downwards OR upwards, compressor or expander. Limiting and gating are options as well making this a Swiss Army Knife of dynamics processors. The Expert tab opens up a whole new world of control by letting users have full control of the sidechain signal. Power users can audition, choose internal or external, and even tune the exact frequency sensitivity of their sidechain. The Stereo Link feature, which changes how the gain reduction of each individual channel affects the other rounds out the set. Over the last few months of using this plugin, I have really come to be aware of how flexible it is. I often found myself reaching for it when no other form of processing was capable of the kind of surgical control I needed. On a set of overheads played by an…enthusiastic drummer, I was able to reign in the wash-y cymbals, and better balance the sound of the drums against them. Using the frequency fine-tune focus of the highest band, allowed me to drop offending hi-hat bleed on a snare mic while accentuating the gut-punch of the snare itself. I really appreciated the variable phase response here as tweaking individual drum elements like this can wreak havoc on your phase relationships if you aren’t careful. In Linear Phase mode, you can tweak any part of a multi-mic setup without losing clarity and focus, at the cost additional latency. Again the flexibility here means informed engineers can make the best choice for themselves. Across entire mixes, I used Pro•MB to great satisfaction. I like being able to discretely adjust the way each band of frequencies can behave (or in some cases, how I want it to not behave). I found the Mix control here to be particularly useful as I was able to get more or less of a particular effect across the board. Scaling the mix past 100% gives you an idea of where you may be processing too much. 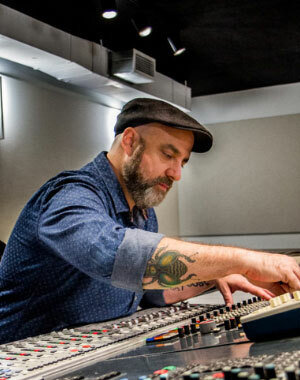 I usually ended up getting each band moving in a way that I really liked and then backing off the entire mix a bit to find the sweet spot for the whole song. Additionally, the ability to adjust the linking of the stereo channels is an indispensable tool. Past 100% link, the processing eventually switches over to mid-only, or side-only processing, with a button to select between the two. Combining that feature with the range (which offers +/- 30 dB of gain) allows you to use downward compression on the mid signal only to solidify your low end, downward expansion on your low-mid band in stereo to quell muddiness, upward compression on your high-mid band to bring out low-level detail without sacrificing transient response, and upward expansion on your high band in side-only mode for extra sparkle and spread. And you still have two bands left to go after any particularly annoying resonances or to tame certain elements. In short, I have no real reservations about this plug-in. FabFilter has delivered again with a beautiful looking plug-in that sounds fantastic and works no matter what you throw at it. If I had to be picky, I’d say that more than 6 bands could be nice, but realistically, this plug-in kills it on every level. In terms of pricing, it’s on the upper end, but the quality and sound easily make it seem fair. CPU usage and latency can be pretty serious with this plug-in, but again not overtly for the sound you are getting. 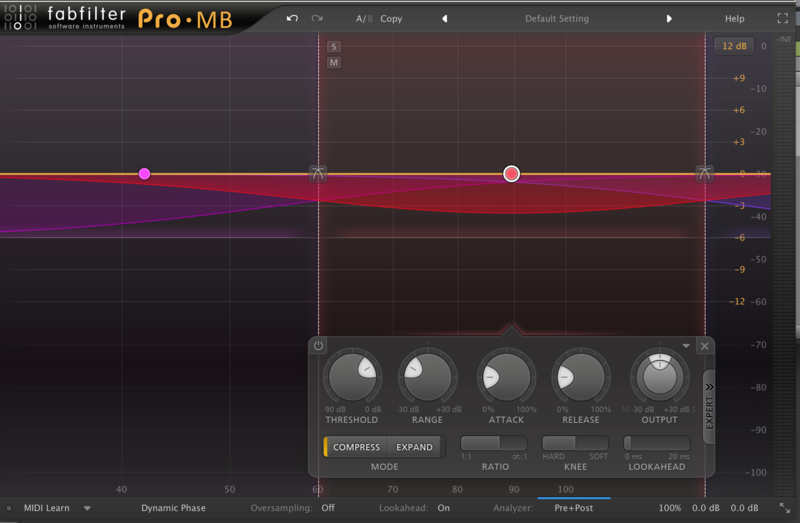 The FabFilter Pro•MB is an amazingly powerful and intuitive tool. 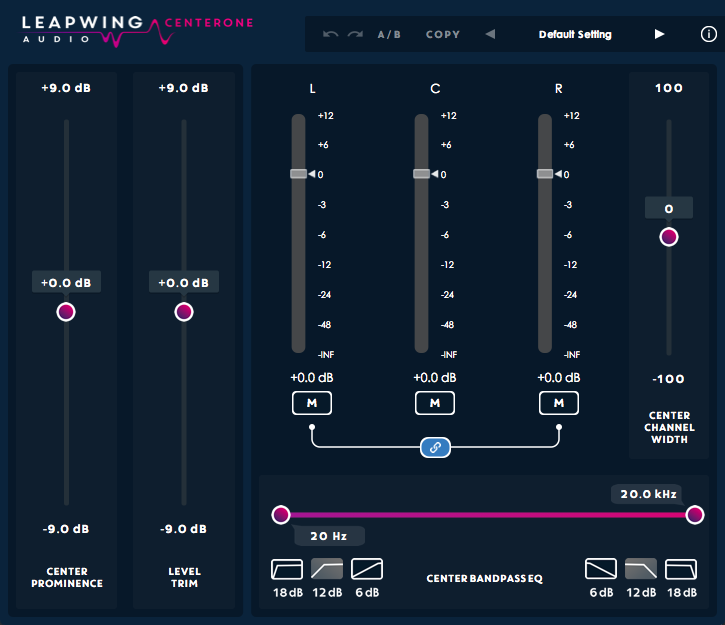 Mastering engineers, anyone who works with loops, samples, or stems, and also just engineers who often deal with raw tracks that are less than stellar will appreciate the level of control available here. 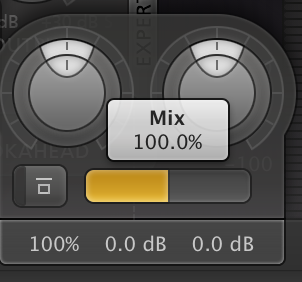 This is a problem-solving plug-in that I now use all the time and has become a staple on my mix bus. Highly recommended!